You cannot expect every teammate to see everything that is going on in the pack at all times. We all have to rely on the eyes, ears and mouths of our teammates for that. That is why communication is extremely important to having an effective pack. Screaming is not effective. Using a firm yet loud voice will get you heard. Imagine you are giving a command to a dog or simply disciplining a child that is not listening to you. Making your way through the pack. Calling out two girls names to assist you. Make a 3 man wall (they are not allowed to look behind them) 4 blocker called out names and tells them where the jammer is. Make 4 lines at one end of the track. Line 1 and 2 are blockers (cannot look behind them). Line 3 is also a blocker but they take off about 15’ behind 1 & 2. 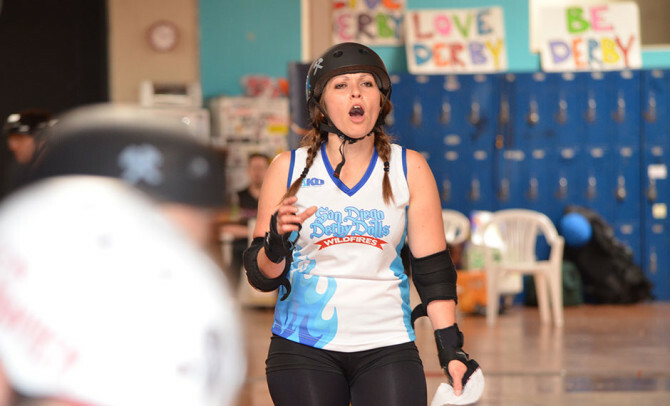 This blocker just communicates to the front blockers where the jammer (line 4) is going. Line 4 (jammer) and line 3 (talking blocker) take of together.